Executive Order 13450 – Improving Government Program Performance is the official policy of the Federal Government to spend taxpayer dollars more effectively each year. Agency Performance Improvement Officers (PIOs) must develop and improve the agency’s strategic plans, annual performance plans, and annual performance reports and assist the head of the agency in the development and use within the agency of performance measures in personnel performance appraisals, particularly those of program managers. The Program Assessment Rating Tool (PART) was “developed to assess and improve program performance so that the Federal government can achieve better results. A PART review helps identify a program’s strengths and weaknesses to inform funding and management decisions aimed at making the program more effective”. (Source: OMB Website) A Federal website,expectmore.gov, displays performance information online for the public. Do Open Government philosophies and programs enhance an Agency’s focus on their mission? Do the efforts support annual performance goals? Will senior managers be able to use the performance and financial data that is created through Open Government to manage their programs? How do we link agency employees’ appraisals to the agency missions, goals, and outcomes associated with Open Government? 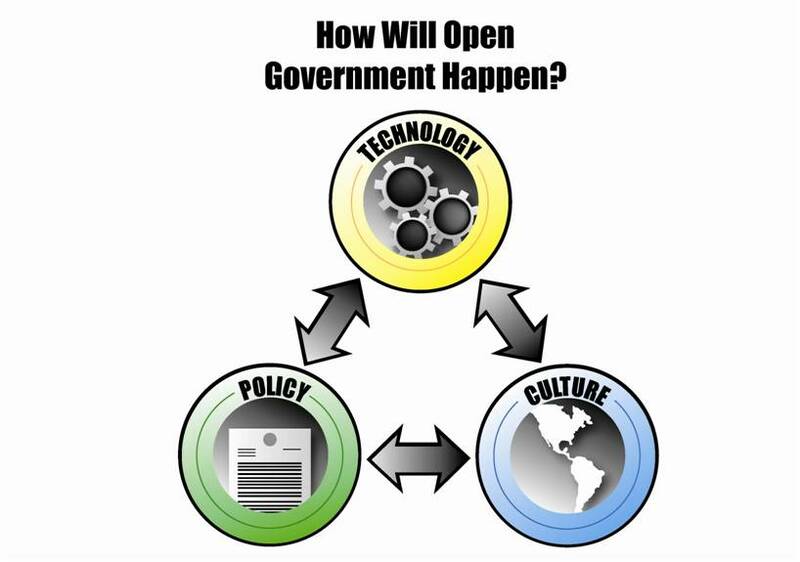 How will we apply program evaluations (PART) to assess the effectiveness of Open Gov programs? 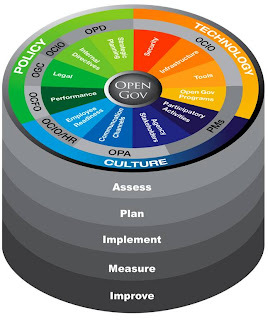 What is the full cost of achieving the performance goals associate with Open Government? What is the marginal cost of changing performance goals due to Open Government? Will budget requests need to be altered as a result of Open Government efforts? How do we measure baseline performance targets associated with the Open Government? Integrate the Federal-wide goals of transparency, participation and collaboration into strategic planning and performance management for the Agency. Work alongside and appreciate the importance of “techies” to understand the scope and possibilities for the effort. This will enable them to understand how technology has evolved and will evolve to assist agencies in meeting the Federal-wide goals of transparency, participation and collaboration. Be open. What is defined as “success” and a performance target should be evolving as technology moves forward. We should not continue to pursue outdated targets as possibilities change with technology. Motivations: OGC’s primary mission is to provide legal opinions, advice, and services with respect to all agency and departmental programs and activities. OGC’s are charged with ensuring compliance with all federal laws, statutes, and OMB guidance in all Agency activities. They keep the rest of us out of trouble and handle disputes with agency decisions as they emerge. Approach: OGC’s must survey and interpret a host of different information sources to develop a legal opinion on any new government effort, including open government programs. Legal Counsel will review Agency statutes, federal laws, OMB guidance and directives, OMB circulars, and internal Agency policies to advise the client on actions that are legal, illegal, and those that may need slight modification to transfer between the two. This activity can be quite time consuming, especially in areas where substantial case law does not exist (i.e. the questions being asked are new). What is your authority for creating this tool or program? Are there any statutory constraints or enablers that impact the Agency’s use of open government tools, including security protections? Will the tool be collecting information from the public, and if so, will it violate the Paperwork Reduction Act (PRA)? Are you seeking consensus advice from the public, and if so, will it trigger the Federal Advisory Committee Act (FACA)? Are your tools 508 compliant and do they meet the requirements of all accessibility laws? Is the Agency okay with the tools “terms of service”, if it is an established tool? Does the program meet all privacy regulations and is a privacy impact assessment (PIA) required? If access is restricted, what is the basis for restricting access and should there be an access policy? Is the content on the tool considered a “federal record” and if so, should a disposition schedule be developed? Work alongside the strategists and program developers to understand the purpose of the effort. This will enable them to advise the effort in real-time and prevent most legal issues from emerging down the line, which could slow or completely halt all efforts. Be open. Open Government is a new application of several outdated laws (NARA, PRA, FACA, etc…) and OGC’s across the federal government are sharing legal opinions that are flexible but still operate within the boundaries of the law. Motivations: Program Offices are often those folks that are motivated by outputs and outcomes that most directly relate to the bottom line mission areas of an Agency. They are charged with implementing programs that tie into the strategic goals of the organization and are often the closest to the stakeholders. These folks are closest to the pain points in Agency processes and statutory limitations. They know what they need to be successful but often times face barriers in implementation with the integrating offices (OCIO, OPA, OGC, etc…) so they often “go it alone” and do what works for them in order to meet their mission, not focusing on integrating their efforts with the needs of the entire organization. In a perfect world, they would have access to customizable solutions to help them meet their business needs that have already taken into account the hard legal, policy, technical and performance questions. Approach: Program offices identify a business need, and will fill that gap with the solution that best balances their time, resource, cost and technology limitations. To create these solutions, program offices tend to follow some form of a project management process to design, implement, maintain and improve upon their initiatives, consulting other offices when appropriate. What type of information sharing with the stakeholders will help me to achieve my strategic goals more effectively? Will open government tools help my bottom line by making public engagement easier? What type of outreach reaches my stakeholders the most effectively? Do those stakeholders have the technological maturity to transition to a primarily online collaboration environment? What type of program is realistic to maintain given my personnel, budget and time constraints? What tools are available for me to use? Are those tools adequately vetted from a security, privacy and utility perspective? How much ability do I have to execute creative license over the tool to customize it for my needs? Is there any reason why I can’t do what I want to do (internal policy, statute, the law, etc…)? Has an effort like this worked any where else outside my organization or within it? Be provided with a source where Agency best practices and resources can be shared so each program office is not forced to ask these same difficult questions each time a new business need emerges.